Third king of Judah; son of Abijam and grandson of Rehoboam; reigned 917-876 B.C. (I Kings xv. 7-9). The most important event of his reign was the deliverance of Judah from Baasha, king of Israel, under whom the superior strength of the northern kingdom assumed a threatening aspect. 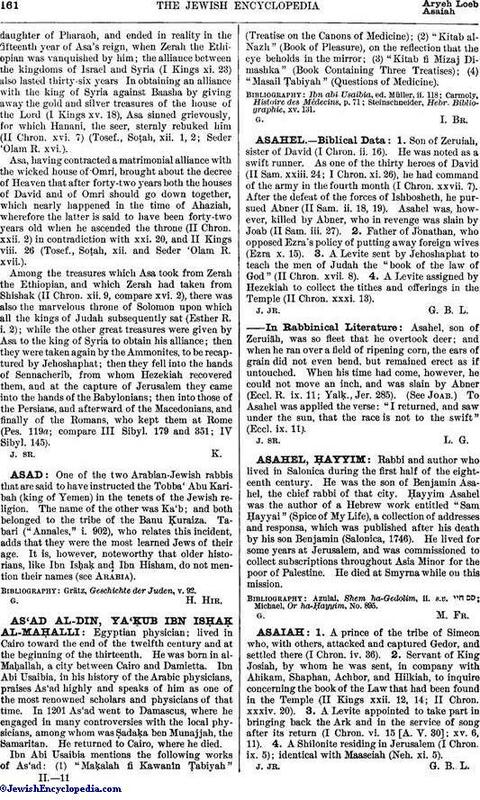 Baasha raised a fortress at Ramah, four miles from Jerusalem; and, in order to secure immunity from his attacks, Asa was obliged to obtain the help of Ben-hadad I. of Damascus, thus involving the Arameans of Syria for the first time in the affairs of Israel. Ben-hadad invaded the most northerly territory of Israel northwest of the Sea of Galilee, and annexed it to his own dominions. The price paid to the Syrian king by Asa was taken from the store of silver in the Temple and the royal palace. Baasha was forced to retire; and Asa, using the material of the ruined fortress of Ramah, built Geba and Mizpah for the defense of his northern frontier (I Kings xv. 16-22). Asa also repelled a raid of Egyptians and Ethiopians under Zerah (Osorkon II.) (II Chron. xiv. 9-15). According to the narrator in I Kings, Asa was a religious reformer, putting down impure worship with an unsparing hand (I Kings xv. 11-15); but, while he was on the whole a wise and successful ruler, the picture given of him is somewhat vague. His religious reforms, more particularly, can hardly have been thorough, in so far as no traces of them are to be observed in the reigns of his successors. See Baasha and Ben-hadad. The chronological discrepancy between II Chron. xvi. 1 and I Kings xvi. 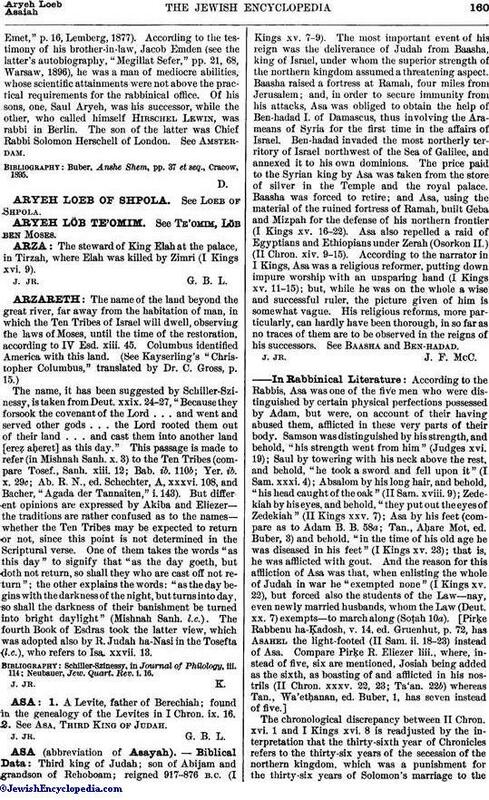 8 is readjusted by the interpretation that the thirty-sixth year of Chronicles refers to the thirty-six years of the secession of the northern kingdom, which was a punishment for the thirty-six years of Solomon's marriage to thedaughter of Pharaoh, and ended in reality in the fifteenth year of Asa's reign, when Zerah the Ethiopian was vanquished by him; the alliance between the kingdoms of Israel and Syria (I Kings xi. 23) also lasted thirty-six years In obtaining an alliance with the king of Syria against Baasha by giving away the gold and silver treasures of the house of the Lord (I Kings xv. 18), Asa sinned grievously, for which Hanani, the seer, sternly rebuked him (II Chron. xvi. 7) (Tosef., Soṭah, xii. 1, 2; Seder 'Olam R. xvi.). Asa, having contracted a matrimonial alliance with the wicked house of-Omri, brought about the decree of Heaven that after forty-two years both the houses of David and of Omri should go down together, which nearly happened in the time of Ahaziah, wherefore the latter is said to have been forty-two years old when he ascended the throne (II Chron. xxii. 2) in contradiction with xxi. 20, and II Kings viii. 26 (Tosef., Soṭah, xii. and Seder 'Olam R. xvii.). Among the treasures which Asa took from Zerah the Ethiopian, and which Zerah had taken from Shishak (II Chron. xii. 9, compare xvi. 2), there was also the marvelous throne of Solomon upon which all the kings of Judah subsequently sat (Esther R. i. 2); while the other great treasures were given by Asa to the king of Syria to obtain his alliance; then they were taken again by the Ammonites, to be recaptured by Jehoshaphat; then they fell into the hands of Sennacherib, from whom Hezekiah recovered them, and at the capture of Jerusalem they came into the hands of the Babylonians; then into those of the Persians, and afterward of the Macedonians, and finally of the Romans, who kept them at Rome (Pes. 119a; compare III Sibyl. 179 and 351; IV Sibyl. 145).